Pre-operative consultation process will be a crucial part of the ear cosmetic surgery procedure. During the consultation, the surgeon will discuss various aspects of the surgery, perform a detailed examination of the patient’s ears and face, and suggest the most appropriate treatment approaches and alternatives. The first goal will be to determine whether otoplasty is the ideal procedure to meet the patient’s requirements. Once otoplasty is determined as a feasible option, the surgeon will explain the steps involved in the procedure and provide instructions for preparation to recovery stage. The patient should feel free to ask questions and clarify their doubts during the consultation. Facial plastic and reconstructive surgeon Dr. Eric Yavrouian provides ear surgery to patients in Glendale, Pasadena, Burbank, Greater Los Angeles, Beverly Hills, CA, and surrounding communities. At the beginning of the consultation process, the surgeon will seek to understand the patient’s reasons for undergoing ear surgery, and which aspects of the ears may be troubling them. The surgeon will also inquire about any pre-existing medical conditions and ask them to arrange for past health records. The patient should be forthcoming about all relevant health details to enable the surgeon to prepare an appropriate ear cosmetic surgery plan. The surgeon will encourage the patient during the initial consultation to share their inherent aesthetic needs, goals and desired with regard to their ears and face. Once the surgeon is fully clear about what the patient wants, they will be in a position to create a customized ear surgery plan to meet the specific requirements of the patient, and ensure maximum patient satisfaction. If the patient has a habit of smoking, drinking alcohol, or drugs, they should be prepared to share information transparently with the surgeon for their own sake. The surgeon will be able to advise appropriate measures, suggest alternatives, or instruct them to quit the habit for a certain minimum time period before and after the surgery. The patient should also prepare a list of all the prescription and non-prescription drugs, including herbal supplements and vitamins that they may be currently taking. The surgeon may stop or alter the schedule of certain medications in consultation with the primary care physician. The surgeon will encourage the patient to ask questions and clarify all their doubts and concerns before going ahead with ear surgery. The patient may preferably make a list of all the questions they want to ask, and carry it along to the surgeon’s office for the consultation. 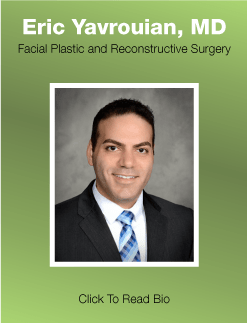 Facial plastic and reconstructive surgeon Dr. Yavrouian receives patients from Glendale, Pasadena, Burbank, Greater Los Angeles, Beverly Hills, CA, and nearby areas. The surgeon will like the patient to develop realistic expectations about the ear surgery procedure. They may present ear surgery before and after pictures at the time of initial consultation to let the patient know what to expect and what not to expect from it. Testimonials of past patients may also be provided at patient’s request to give them insights about the views of other patients.